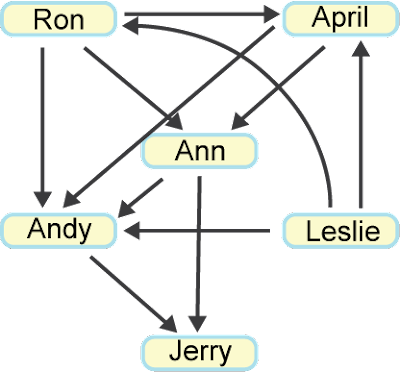 In mathematics, a graph is a representation of a set of objects where some pairs of the objects are connected by links. The interconnected objects are represented by mathematical abstractions called vertices, and the links that connect some pairs of vertices are called edges. We import the Graph module and define a simple Letter data type, then build our Graph from it. The set of vertices are the letters A, B, C, D, E, and F, and the edges are modeled as above. Now that we know how to build graphs, we can start modeling more important information with them. This is a little hard to mentally parse, so why don’t we model it as a graph to make it a little more readable? Each person can be represented as a vertex, with outgoing edges representing connections to the people they beat. The graphFromFile function takes a String and returns an IO (Graph String). The function reads a file, parses it into two important pieces: verts (the set of all unique strings in the file, or, our vertices) and conns (the set of connections between strings in the file). It then builds a Graph from this data, wraps it in the IO monad with return, and gives it back. Now you might have been wondering from the beginning of this section what the ranking from the dance competition was (maybe you even figured it out on your own!). How do we do this programmatically, using our graph? 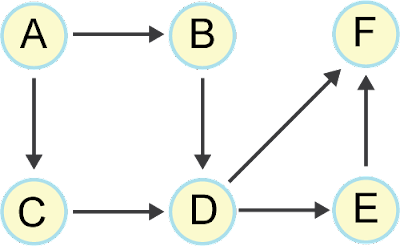 In computer science, a topological sort of a directed graph is a linear ordering of itsvertices such that, for every edgeuv, u comes before v in the ordering. tsort' l     _            = error "There is at least one cycle in this graph." Our tsort function first finds the elements in the graph with no incoming edges using the function noInbound. We pass this into a sub-routine tsort' that takes a sorted list l, a list of vertices with no incoming connections (n:s), and a graph g. We operate on the first element of the set of vertices with no incoming connections n, finding outEdges (the outgoing edges from n), and outNodes (the nodes that n points to). We build a new graph g' with the outEdges removed, and find the nodes in g' with no inbound connections, and add them to s. We then recursively call tsort' with these new parameters (and prepend our current n to the sorted list), until there are no more nodes to check. At this point, if the edge list in the graph is empty, all is well and we return the list of sorted elements. Otherwise, an error is thrown stating that there is at least one cycle in the graph. Now that we’ve got that, we’re ready to find out how everyone ranked in the dance competition! As you can see, Graphs are very useful data structures. They can be used to model a huge variety of things (see how many more you can come up with, they’re everywhere!). Topological sort in particular is a pretty remarkable algorithm, and can be applied in many different situations from the one above. For example, finding paths through college courses with prerequisites. It’s even used in UNIX systems to schedule processes according to their dependencies.